confession of Christ and to suffer eagerly for the truth. appearance of His Cross to Constantine the Great, to whom He was pleased to entrust the kingdom of Rome, the Lord God "raised up a horn of salvation" for His people. The Emperor Constantine, recognizing the One God and placing all his hope in Him, conquered all his enemies by the power of the precious Cross and ordered all temples of idols to be destroyed and Christian temples to be restored, and dispelled the vain hopes of his predecessors. He liberated all confined in prisons for Christ, and honoring them with great praises as courageous warriors, returned these confessors of Christ each to his fatherland. 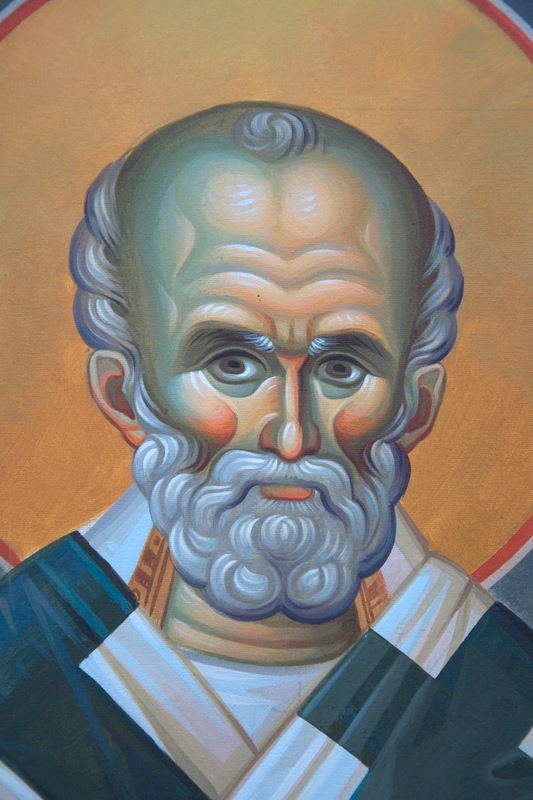 At this time also the city of Myra again received its shepherd, the great bishop Nicholas, who had been deemed worthy of the crown of martyrdom. Bearing in himself the Divine grace, he, as before, healed the passions and ailments of people, and not only of the faithful, but also the unbelievers. Because of the great grace of God that dwelt in him, many glorified him and were astonished at him and all loved him. For he shone with purity of heart and was endowed with all the gifts of God, serving his Lord in holiness and righteousness. At that time there remained still many Hellenic temples, to which impious people were attracted by devilish suggestion and many inhabitants of Myra remained in perdition. The archbishop of the Most High God, animated by Divine zeal, visited all these places, destroying and turning into dust the temples of the idols and purifying his flock from diabolical defilement. Thus fighting with evil spirits, St. Nicholas came to the temple of Diana, which was very large and richly adorned. presenting an agreeable dwelling for demons. 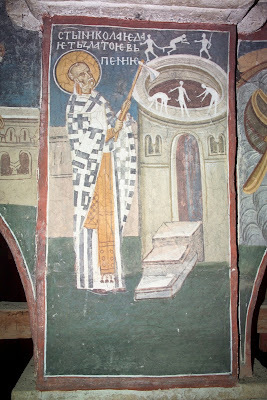 St. Nicholas destroyed this polluted temple, leveled its high edifice to the ground and the very foundation of the temple, which was in the earth, he scattered in the air, taking up arms more against the demons than against the temple itself. 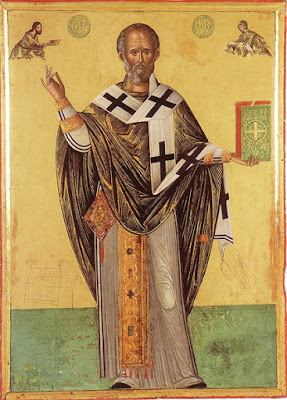 The evil spirits, not enduring the arrival of the servant of God, uttered doleful cries, but, vanquished by the weapon of prayer of the unconquerable warrior of Christ, St. Nicholas, they were forced to flee from their habitation."